OnePageCRM is a simple sales application for small to medium sized businesses. 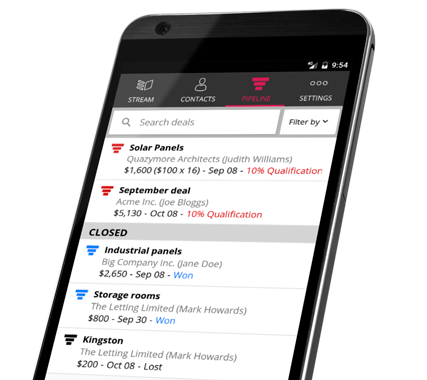 It's designed to help you follow up with your leads, manage your customers and track sales on the road or in the office. Are you a Vodafone customer? How does OnePageCRM help your business? ✔ Simple to use: OnePageCRM is as easy to use as email so you can quickly follow up with your leads and customers. ✔ Next Action Sales: Built in action method helps you get organized and stay in control. ✔ Powerful pipeline features: Ideal for forecasting and sales tracking. ✔ Mobile access: Native iOS and Android mobile apps ensures you have access to your contacts, while on the go!